My Sweet Shy-Cat in her toasty nest next to the wood stove. I am here to share a Christmas card I made inspired by the Winnie & Walter Rerun #17 Challenge. This is where they select an older W&W set to "rerun" with the DT making all sorts of gorgeous projects with it. 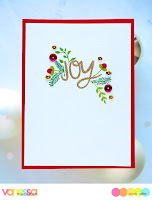 This month the featured set is their In Bloom: Hollie's Festive Florals. You don't have to use that particular set to participate....but if you don't have it, you must use a W&W product (It can be a freebie!) and be inspired by something the DT made with the set. Easy peasy.....and so much fun!!! 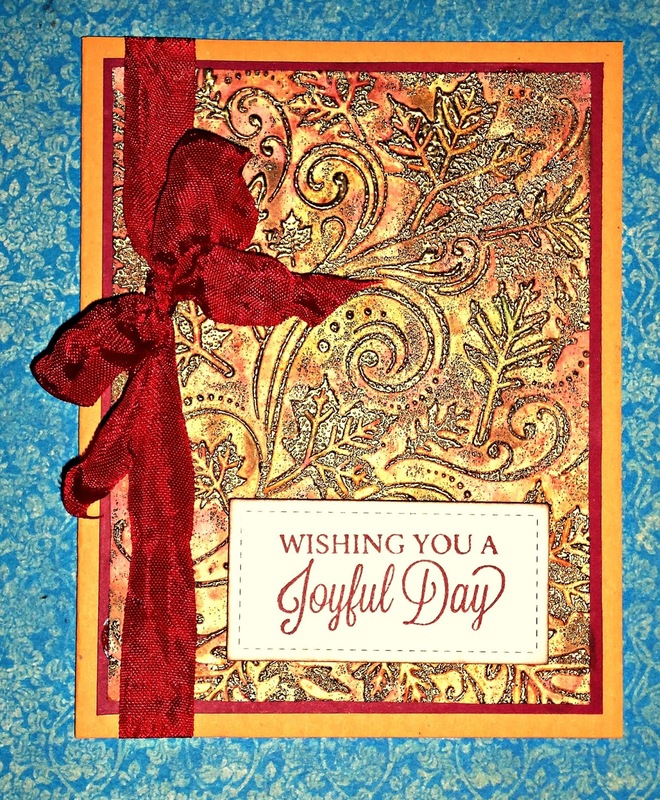 Love the JOY surrounded by motifs by Vanessa! Love that strip across the center of Lydia's card!!! 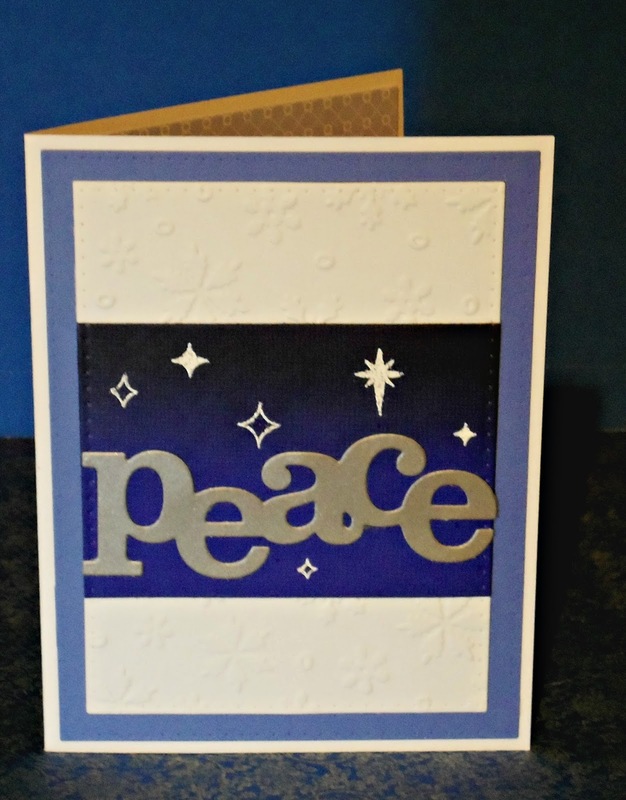 I wish you could see the dry embossed snowflake pattern on the white background better! Thank you so much for stopping by. I wish each of you a very Happy New Year!!! Fall Back in Time......to Thanksgiving! Here is Skippyjon taking a much needed rest from his misadventures next to his "Uncle" Othello. 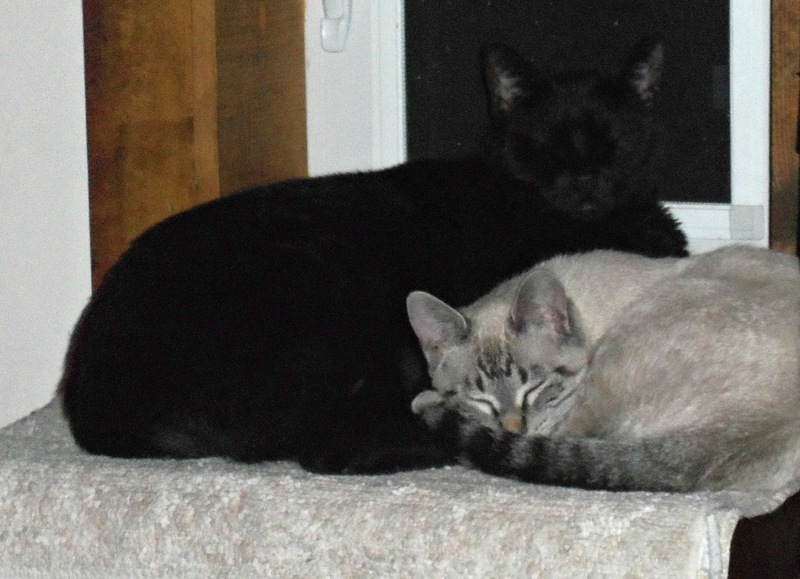 It's sweet how often one of our big neutered males will take on the role of "uncle" to a half-grown kitten. Skippy teases Othello mercilessly, but Othello kind of likes the little squirt, nonetheless. Yes, I know it is winter and that autumn is past, but there is a reason I made a fall card. Sadly, the gals over at Always Use Rubber (formerly Twofers) are closing up their challenge blog and I wanted to get in on their very last challenge with the theme of Summer &/or Fall, which is a nod to the peeps living in the southern hemisphere. So.......out came my unused autumn-themed backgrounds that I still had on hand and I made a Thanksgiving card for next year. Yay! I found a pretty double-embossed background I liked a lot. I went ahead and put it on a maroon mat and then decided to try something different. (I should have done this next step before I matted, but it worked fine this way, too.) I laid one of the stencils from the Artistcellar - TEXTures 2 Series 4-stencil set over the top and sponged on some Distress Ink in Walnut Stain. Then I angled the same stencil over the background and sponged again using Distress Ink in Fired Brick. I hadn't ever tried doing this on my backgrounds before, but I like the effect. I think these colors give my background a smoky, fiery depth. Since some of you might be unfamiliar with my double-embossing technique, I am including this close-up so you can see the detail. 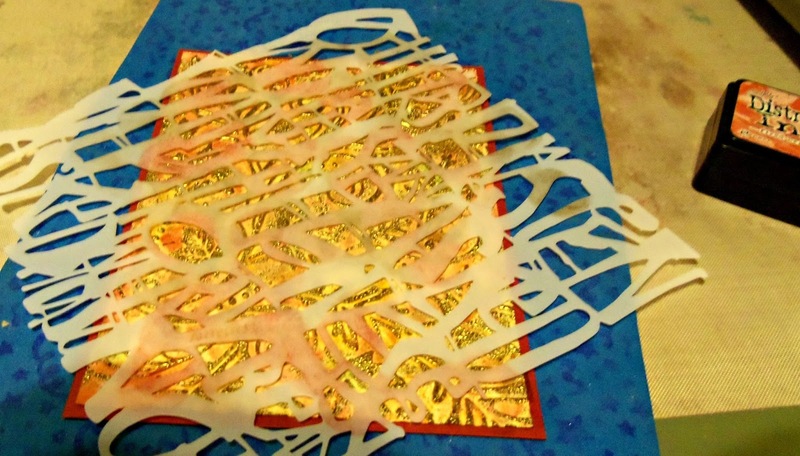 It also shows the gleam of the gold embossing powder better than the full shot above. On this particular one, I sponged Distress Inks over the surface of my Fall Leaf embossing folder and misted lightly with water. Then I ran a piece of Core'dinations heavy duty white cardstock inside the folder through my Big Shot. The paper not only gets embossed, but also gets a watercolor effect from the inks. 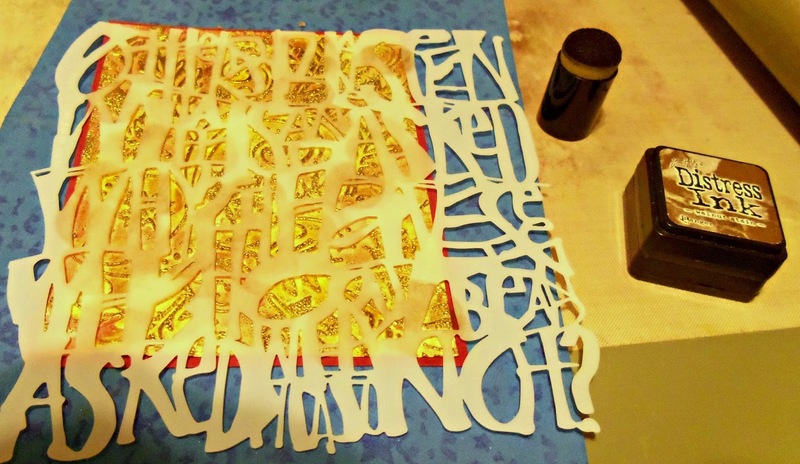 After it was completely dry, I lightly brayered Versamark ink over the raised pattern and heat-embossed with gold powder. I did this step 2 or 3 times to get a nice build-up of gold on my pattern for that chunky texture that reminds me of heavy vintage jewelry. LOVE!!! A big thank you to Jane, Zoe, and Christi over at Always Use Rubber for all the work they have put in to their fun challenges. I am really going to miss your creative themes and sweet comments!! I wish you much rest, relaxation, and fun crafting times in the future. Thank you, everyone, for stopping by! 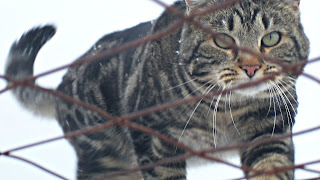 I appreciate your comments so very much!!! Have a lovely day. The cute little caroling mouse is an ancient Hero Arts stamp I found at a thrift store. The date on it says "1980"!! (Holey moley.....Even I wasn't rubber stamping clear back then!!! I didn't know ANYONE was rubber stamping back in those days!!) I picked it up some time ago and I think this is only the first or maybe second time I have used it. I stamped the little mouse with Versafine ink in Vintage Sepia and heat embossed with clear powder. Then I colored her with watercolor pencils and my water brush and colored over the dress with my Wink of Stella pen to add some sparkle and shimmer. TIP: The flower (which already came with the glitter on it) was a little bit too white, so I colored the petals with my Spectrum Noir EB1 marker which gave it just the right vintage tone. Considering I am not a tag maker, I am very pleased with how this one turned out. It helped a lot to make this one smaller than my other gargantuan-sized one!!! 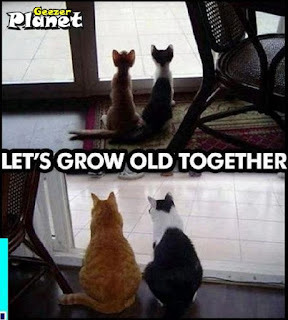 lol... Hope you enjoyed this one, too! Okay....got it linked up so I am back. Whew! I loved the idea of making a springy card because we are in the middle of a winter storm right now. We have around 16 inches of snow on the ground, which for right here is quite a bit. So some flowers and spring colors sounded like a fun challenge! 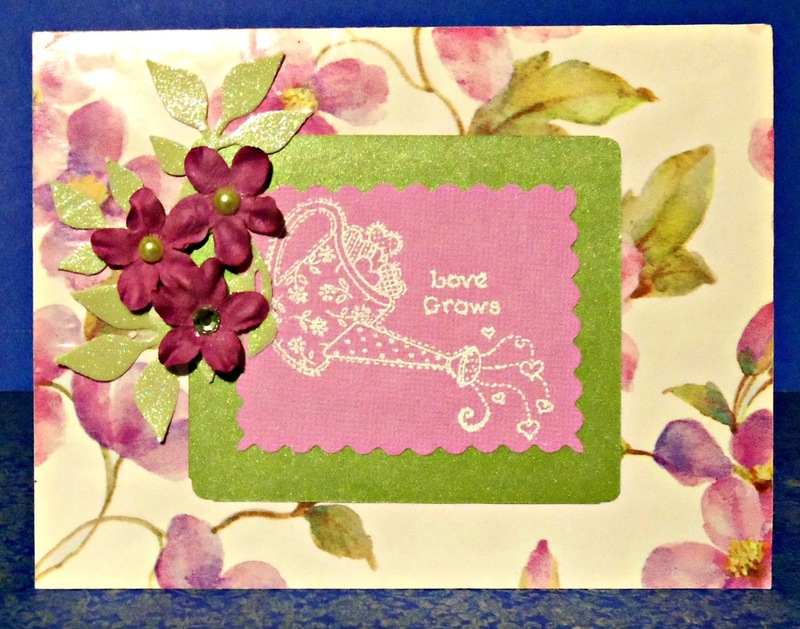 Hope you enjoyed this springy card. 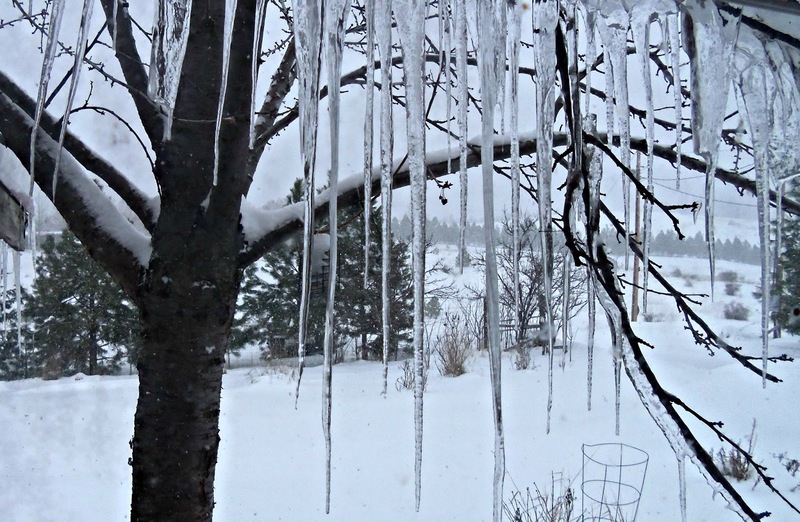 If you live in a snowy place, maybe it will help give you hope for warmer days ahead! Don't Put the Christmas Supplies Away Yet!!! 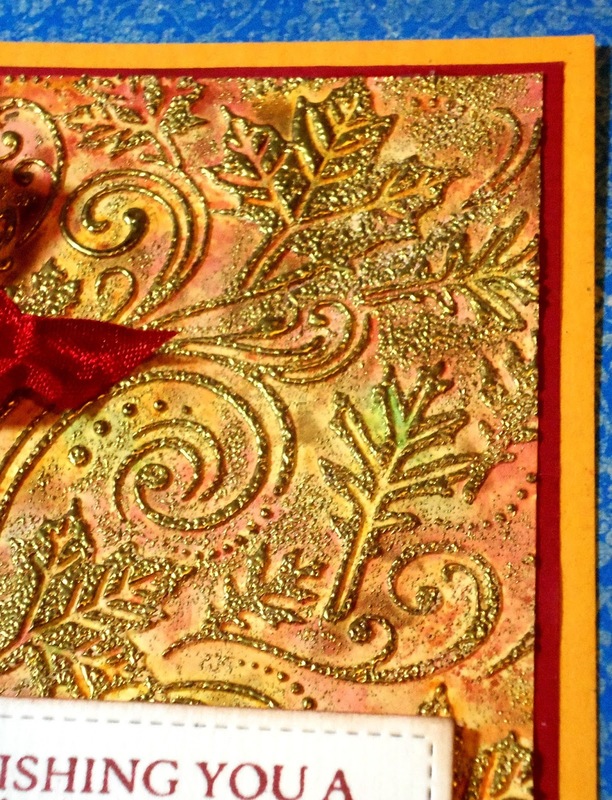 Am I the only one that keeps Christmas cards I have received on display for months, sometimes longer when it is a special one from one of you? 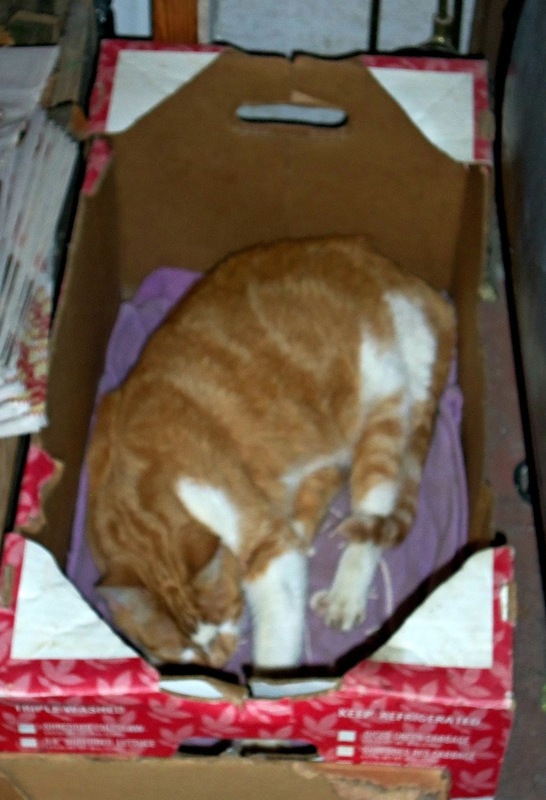 If you are like me, though, you can't stand to just put last year's Christmas cards in a box, never to be unearthed again....or worse, to throw them any of them away!! Horrors! 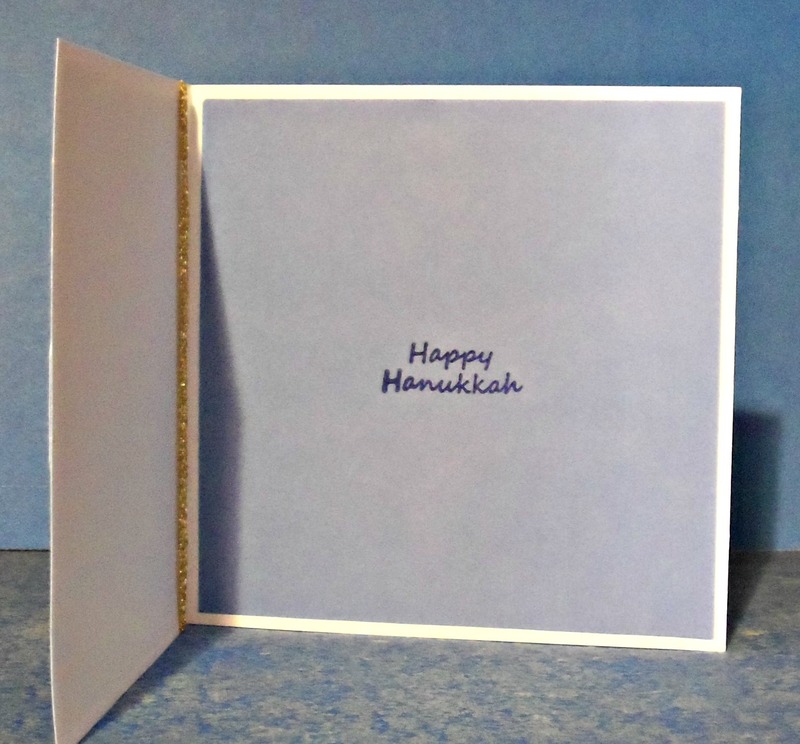 Right after Christmas is the time when I like to remake some of the lovely commercially-made cards I have saved from several years back. Oftentimes, they require but little embellishment to give them new life. I have several die sets that I turn to for these remade cards. Here I used some retired Clearly Besotted dies for the modern tree and tinsel garland. The foam snowflakes (yes, I still have a few of these that have 7 points!!! Wha-aaaat?) are from the dollar store and the little sentiment sticker is from Echo Park. 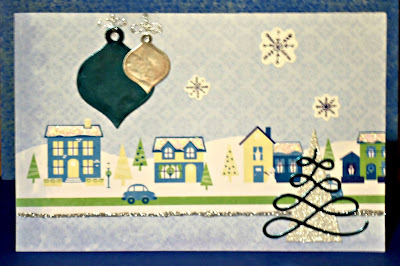 I covered the card base with the large town scene and put some glitter glue here and there. 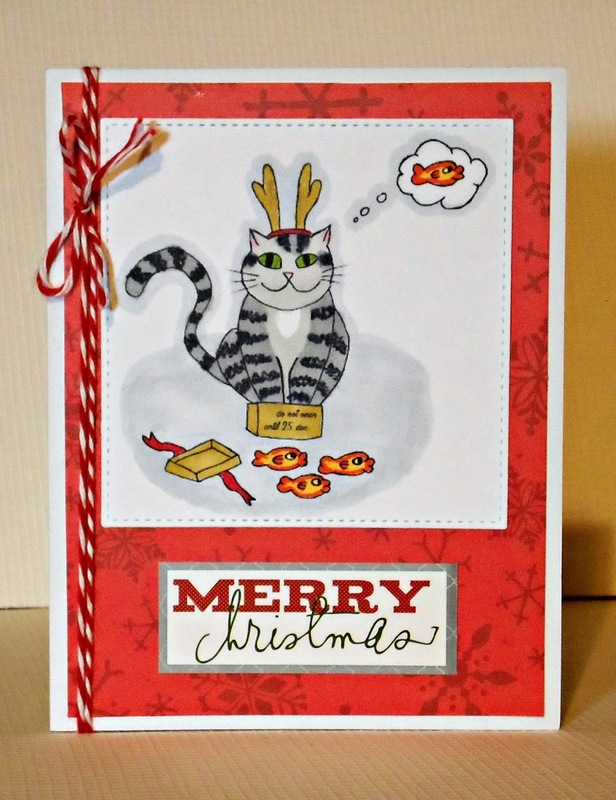 Die cuts include the same retired ones from Clearly Besotted and also from my Spellbinders - Holiday Tags die set. 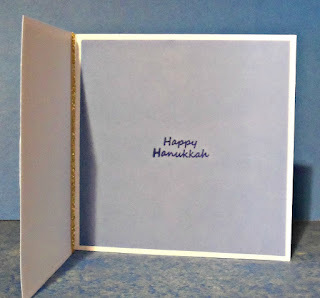 Some snowflake stickers from Echo Park finished up this simple but fun card. Hope you liked these quick cards. They aren't fabulous or outstanding in their technique or design, but they still have that handmade touch that adds warmth and depth. And....it makes use of something that might otherwise get discarded. Have a wonderful in-between week. Hope you are crafting during this lull with some brand-new supplies!! 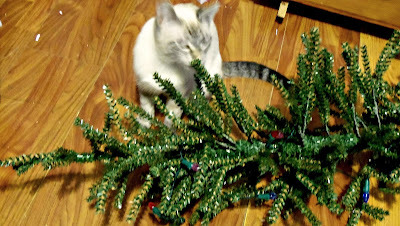 Naughty Skippyjon has knocked over my little fake tree and is chewing on the bristly branches. Now that he has discovered how enjoyable it is to gnaw on these scratchy things, I can't keep him away from it. He thinks getting sprayed by the water bottle is a fun game!! Merry Christmas!!! Merry Christmas to you! I love it when Christmas lands on a Sunday and we aren't traveling so we can attend worship at our little country church. We live in North Central Idaho and almost always can count on a lovely white Christmas. This year we have a fresh blanket of snow over the old snow and it is just gorgeous. Our little community is transformed into a Norman Rockwell-esque painting signed with a flourish of snowflakes by the Master Artist himself. I just love celebrating our Savior's birth together with my neighbors in this beautiful place where we are privileged to live! The reason I am posting on my blog on Christmas Eve is because my friend Fiki over at Bad Kitty's Craftroom has an adorable digi image she drew and a fun giveaway if you link up a project with her digi. I meant to do this way earlier in the month, but things just got away from me and all of sudden I remembered!! EEEEK!! Well, it is soooooooo cute of an image that I didn't want to miss out. I printed it and went right to work coloring with my Spectrum Noirs and Ultra-fine Sharpies. Here's another naughty kitty.....well, not too naughty, just typical. He has opened one of his gifts (not sure if he waited until Christmas or not, but prob not!) and now he is completely ignoring the brand-new fishy toys and is sitting inside the box!! Hahaha.... so much the way cats are!!! 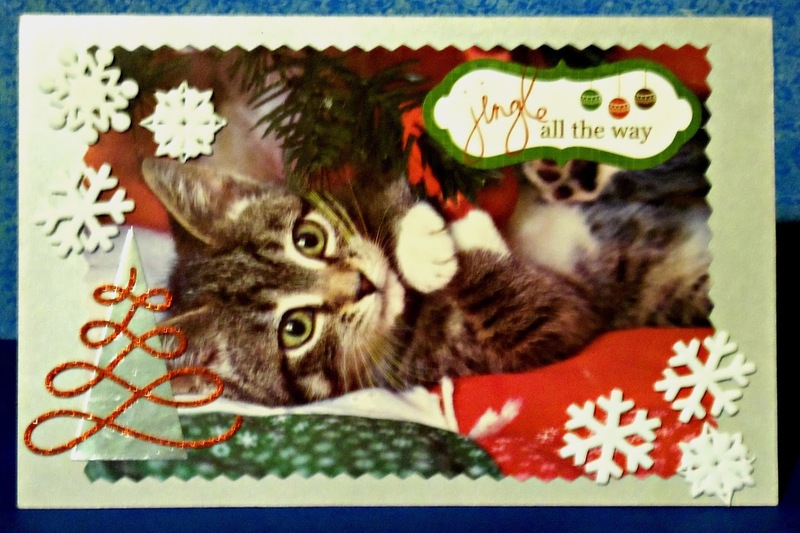 Thank you so much, Fiki, for sharing your adorable art with us and for your sweet giveaway!! Merry Christmas to each of you!!! I hope on this special day when we exchange gifts and spend time with family and friends that you will remember to be thankful for the greatest gift of all, Jesus Christ....and the salvation from sins that He made possible. This is my Judith picking her way on TOP of the overhead fencing on my chicken yard to be with me while I take care of my chickens. Doesn't she look like a wild cat with her puffy wintertime coat? 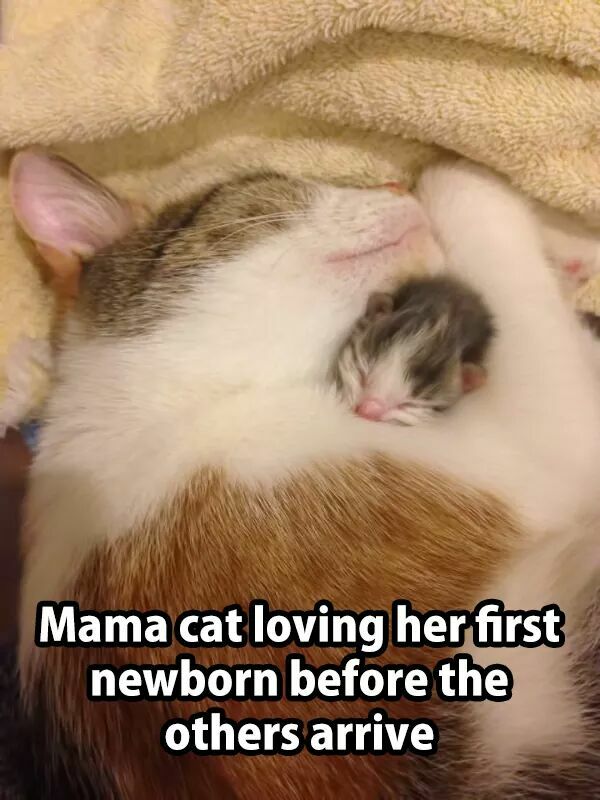 She's actually quite small and very sweet. My gold Star of David is from a kit my daughter found at our local thrift store and put in my stocking last year. I had lost track of it and found it the other day! It had been a deep fuchsia color, but I wanted it gold so I colored over it with my gold Elmer's - Painters Marker. 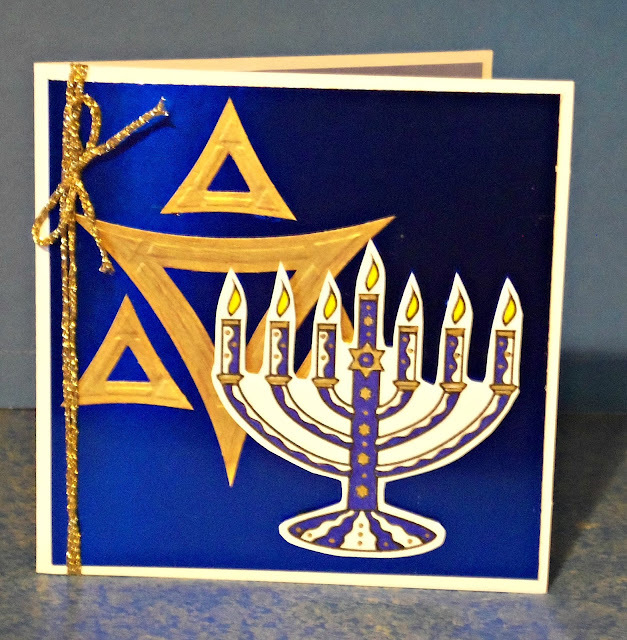 I colored my menorah with a gold Pilot extra-fine tip marker and my ultra-fine tip Sharpie markers. (My regular Spectrum Noirs were not fine enough for the tiny little spaces on this design.) I covered the card base with very shiny blue foil cardstock and attached the menorah with dimensional foam squares over the star. I finished it off with some shimmery gold twine. INSIDE: The sentiment is from A Creative Journey with Melissa - Fall and Winter Holiday Sentiments stamp set. 2. Little Red Wagon Challenge #373 - Follow the Star! Part of my problem is that I don't know how big to make them. I asked my crafty friend Karen Ladd, who makes lots of super-fun tags all the time, how big hers are. When she told me they were only about 4 inches long, I was stunned. How can you do something in that small of a space???? I have no idea!! So you will have to bear with me as I try to make a few tags for this challenge. This is going to be a REAL challenge for me!! Laurel Beard's tag that inspired me. to....by the talented Laurel Beard! This tag is about 8"x4" and so I really scrambled to scrounge enough things to fill it up!! I should have asked Karen about size BEFORE I started this one!! Ha. 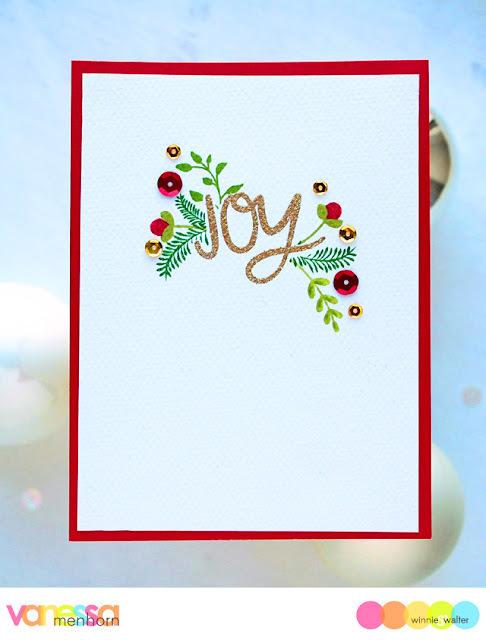 I was tickled to use a cute little Santa journaling card from Pretty Little Studio that had been in my stash for a long time! I stamped "Dec 25" with my SMASH date stamper. For the red double embossed tree, I dry embossed the red cardstock with my Darice - Christmas Tree folder, brayered the design with Versamark ink, and heat embossed with a sparkly white powder. Then I fussy cut just the tree out of the design. You can't see it in this photo, but there is a sparkly rhinestone in the star atop the tree. Whew.....that's a lot of supplies!! I think cards are easier. lol... 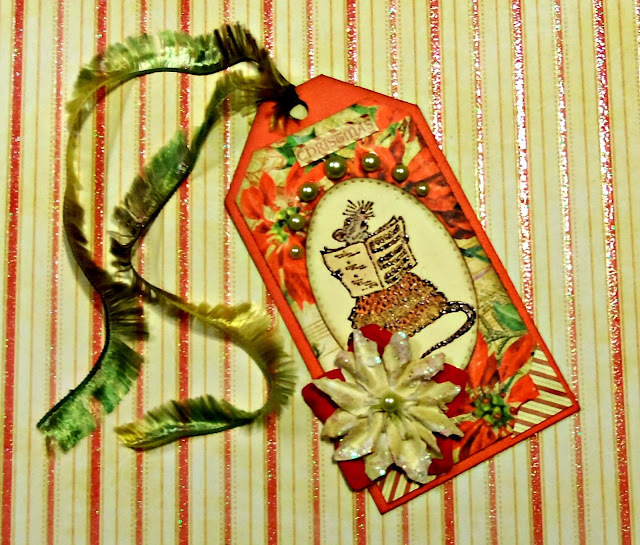 But I am pleased with how the tag turned out and I will try making some more for this challenge. Thank you for stopping by!